Counseling Fees: - For Gen/OBC Category: - 500/-. And For SC/ST Category: - 300/- (Non Refundable). Important Documents: - All the Educational Documents with Caste Certificate, Domicile Certificates and other as applicable. Counseling details: - The counseling will be held on 30 July 2013 to 12 Oct 2013 in Different streams (Arts and Science stream). So all the candidates are must reach their for B.Ed counseling. For more details check the local news paper and you can also download the full advertisement of counseling from the website of Kumaon University Nainital. Or here below I am giving a link to download the complete advertisement of B.Ed counseling of Kumaon University Nainital for session 2013-14. Click here to download the full advertisement of B.Ed counseling. For more details check the website of Kumaon University: - http://kuntl.in. 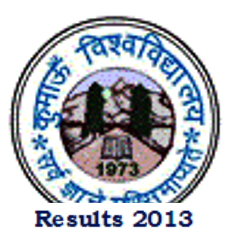 For more details check here the Results of Kumaon University of the session 2012-13. For more updates about exams and results stay connected with our website or you may follow us by email.